This January, a historic number of Asian American women were elected to the U.S. Senate. Tammy Duckworth and Kamala Harris joined Senator Mazie Hirono, the only Asian American woman to have held a Senate position prior to 2017. Here, we’ve compiled everything you need to know about our three Asian American female senators, from political platforms to Twitter personalities. Prior to becoming a Democratic senator, Tammy Duckworth—who lost both of her legs while serving in the 2004 Iraq War—was the the first disabled female veteran in the House of Representatives, representing Illinois’s 8th congressional district. Now, she’s also one of the States’ few Asian American female senators; her mother is of Thai and Chinese descent. 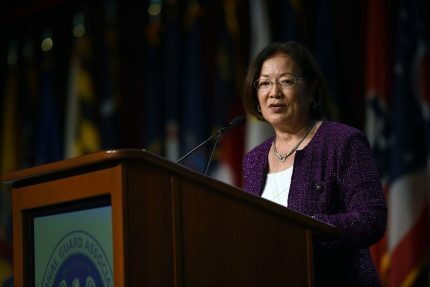 Duckworth’s political platform is dedicated to policies and issues that affect U.S. veterans, advocating for increased accessibility to trauma care programs across the country. Duckworth also prioritizes women’s issues, specifically healthcare and education reform. She encourages women to run for office and promises to fight for equal pay, speaking out on behalf of minority women in the workforce. On social media, Duckworth distinguishes herself with a penchant for candidness. She courageously shares her personal experiences as a U.S. veteran and has used Twitter to demonstrate her gratitude towards the trauma care professionals who helped her adjust to life after the military. She inspires her followers to share their own stories of overcoming adversity and to give back to a community that offered them support and solace. Duckworth’s fun and adventurous spirit also is evident on Twitter; she tweets about the Cubs’ 2016 World Series win and her fourth time completing the Chicago Marathon. Harris, a Democrat, is quite vocal with regards to student issues, as she seeks to increase the accessibility of financial aid and to reduce the pressure of student loans. She also works to reform the process of reporting sexual assault incidents on college campuses. Harris values curiosity and encourages young innovators to pursue educational opportunities in government and in technology. She even takes the time to publicly praise students who make significant contributions to their field of interest. Other goals Harris champions: increased gun control, comprehensive immigration reform, and a fair criminal justice system. On Twitter, Harris has a special knack for connecting with followers on a deeply personal level, often sharing inspiring words and counsel rooted in her own life and family tradition. We especially love seeing the lessons that Harris has learned from her mother. The senator has tweeted: “My mother very much defined success as not only what you accomplish, but what you accomplish for others”—reminding us of where we come from and of our roots. Democratic senator Mazie Hirono is of Japanese descent and has been a Hawaii senator since 2013. Hirono is the first elected female senator from Hawaii, the first Asian American woman to serve on the Senate, the first senator born in Japan, and the first Buddhist senator. Hirono works to combat climate change and advocates for renewable energy sources. Her focus on environmental issues is a deeply personal one, as she hopes to preserve Hawaii’s natural landscape and scenic national parks. She actively discusses Asian American issues, referencing Asian American history and news. Hirono calls for increased representation of Asian Americans in government and inspires us to play an active role in deciding the policies that affect us. Hirono’s initiatives also include protecting minority rights, increasing abortion access, and honoring the rights of veterans. If you’re a visual learner or simply love photography, Hirono’s Instagram account is a treat. Her vibrant photos showcase slices of life, with a single caption or simple sentence to show her stance. Hirono is also big on touting Hawaiian culture, often sharing local initiatives that feature Hawaiian leaders and local businesses, and suggesting ways to engage with local Hawaiian tradition.